WASHINGTON -- Long before dinosaurs roamed the Earth, a bizarre creature with a Venus flytrap-like head swam the seas. Scientists have uncovered fossils of a tiny faceless prehistoric sea worm with 50 spines jutting out of its head. When some unsuspecting critter came too close, its jaw-like spines snapped together and dinner was served. The discovery reported in Thursday's journal Current Biology offers a glimpse into the Cambrian explosion of life on Earth about 541 million years ago. The new creature dubbed Capinatator praetermissus is so different that scientists said the fossils represent not only a new species, but a new genus -- a larger grouping of life -- as well. It was only 4 inches long and its spines were about one-third of an inch long. It feasted on smaller plankton and shrimp-like creatures. It is an ancestor of a group of marine arrow worms called chaetognatha that are abundant in the world's oceans. The prehistoric version was larger and with far more spines in its facial armory but without the specialized teeth of its descendants, said Derek Briggs of Yale University who led a team that discovered the trove of fossils in two national parks in British Columbia, Canada. "The spines are like miniature hooks, although more gently curved. They were stiff rather than flexible," Briggs said in an email. "It's hard to say why there are so many spines in the fossil example - but presumably thus armed it was a successful predator." Capinatator -- whose name translates to grasping swimmer -- lived 500 million years ago at a time when creatures started getting bigger and more diverse. It's difficult to find complete fossils belonging to the chaetognatha family because they decayed easily, said Briggs. This latest find, however, was so good that even soft tissue was saved, giving scientists a good idea about what Capinatator looked like. 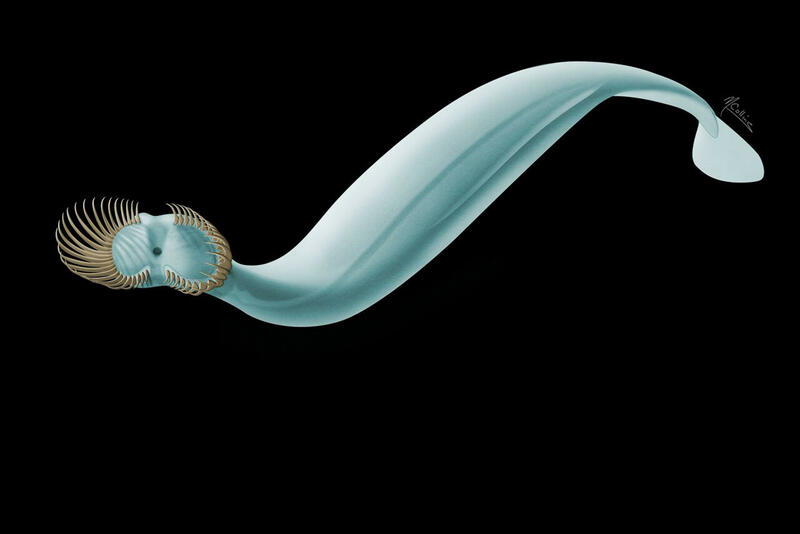 The discovery expands scientists' knowledge of a "pretty enigmatic" group of animals from the Cambrian era, said Smithsonian paleobiologist Doug Erwin, who had no role in the research.